A little over two weeks ago, tornadoes wreaked havoc in Alabama and the surrounding states. I feel very fortunate that the damage we suffered here in East Tennessee was mild comparatively. We'll be getting a new roof and vinyl siding, but many people in Alabama lost everything they owned, and worse. Maybe you've heard of the devastation? A photographer friend captured it perfectly here. That evening, after the storm was over, we emerged from our designated safe-place to find our yard completely covered with soft-ball sized hail. Wow. I've never seen anything so strange and scary! ...and I bake, of course. It's strange how I can completely abandon my worries while whisking eggs and measuring sugar. I know many of you feel the same way. I'll bet you didn't know that cake rolls are my favorite thing to make, ever. They are so simple and beautiful. It's been much too long since I last posted a roulade, so I've decided to put forth a little extra effort and post a video of my roulade making process. I almost hesitate to call this roulade "pink velvet" even though it has everything that a velvet cake is supposed to have, specifically, buttermilk and vinegar. 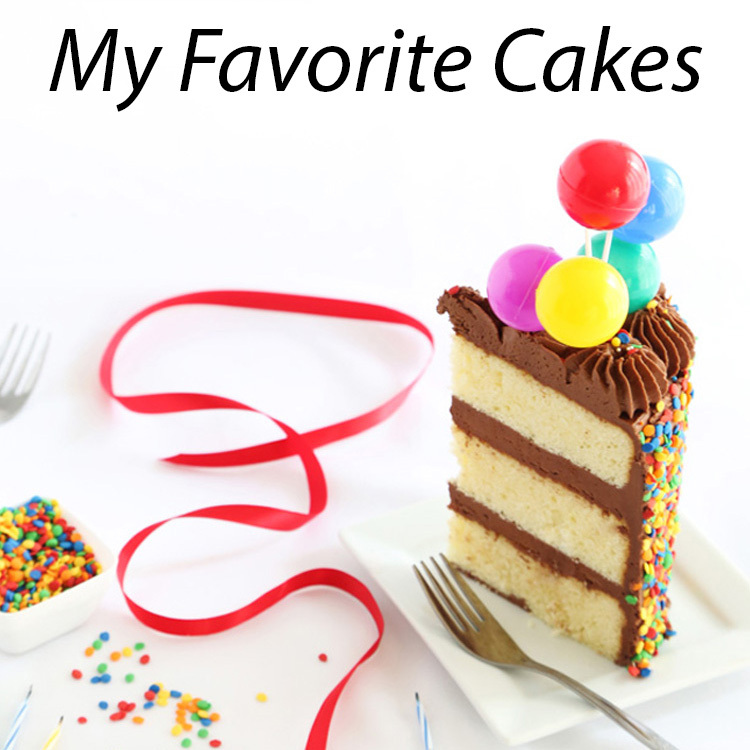 Unlike most true velvet cakes, it has a very mild flavor and isn't overly tangy. 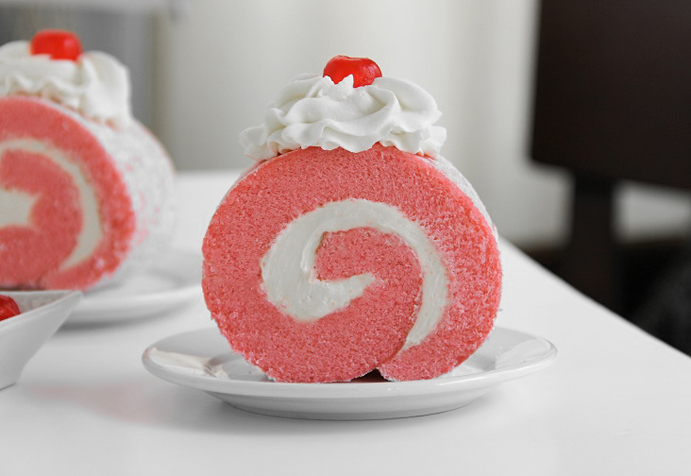 Without the pink coloring, it would be a good all purpose, basic cake roll. I used vanilla Swiss buttercream for a filling, and the overall balance and texture is as pretty as the cake looks. Preheat oven to 350 degrees. Grease a 9x13 jelly-roll pan with white vegetable shortening and line with parchment; grease parchment paper. In a large bowl, beat eggs with a hand mixer for 5 full minutes - set a timer if you need to! Properly whipped eggs will lighten in color considerably and have the appearance of yellow cake batter. When cake is baked turn it out onto the tea towel - do this without delay! Peel off parchment and immediately roll cake into the tea towel, beginning at the narrow end. Roll tightly and as evenly as possible. Place rolled cake on a wire rack seam-side down and let cool completely. Pretty when garnished with sweetened whipped cream and glace' or maraschino cherries. What a beautiful roll, it looks like it would cut so easily and the filling looks so deliciously smooth! In my opinion, you can never have enough pink. So pretty! So pretty! A lovely roulade. Great video too. Love this! And the video is the cutest thing I've ever seen. Your little pugs are the coolest. Heather, this is GORGEOUS!! You make the most beautiful things...is it possible to LIVE in a blog? Because I'm thinking I'd like to live here for awhile. Everything's so pink and magical. Looks so beautiful. It's my daughter's birthday son. Now I know what cake to make her! Thank you so much for the video! I've never made Roulade and you make it look like it is something I could pull off. Your photographs are stunning. Glad that you did not suffer too much damage from the tornadoes but Alabama is still suffering and will be for a long time to come. Horrific what happened to so many in such a brief few moments in time. So pretty! And love the video too. Mmmmm. I've never made a roll cake, which is seeming like a shame, especially since the color of that is so stunning. This is gorgeous, beautiful stunning! I love it! This is the prettiest dessert I've ever seen! You are so talented. Adore that third photo. I did think about you during the devastation of the tornado. I'm sorry about the damage to your home. New roof and siding is pretty major. I couldn't help I notice at the bottom of your post, the cupcakes with the mustache. My husband grew a mustache with goatee this year. That would be so funny to make for him!! Yep. Had to come back. The video!!! Adorable!! I giggled the whole way through. It is fantastic, entertaining, and informative. But...the entertaining part I love! That is the most beautiful dessert I have ever seen. Just looking at the picture makes me happy. I would really like to post this and link right back to you if that is ok. Just beautiful. Gorgeous as usual! I was just looking at a roulade recipe in a new German cookbook I bought today. Your great video may just give me the confidence to try and pull it off. I love your squishy faced co-stars and your pink mixer is beyond adorable. This is a great creation, loving your composition in this set of pictures too! You get better and better, one of my MOST favorite blogs to read. This is so freaking beautiful! Great cake! So much beauty in one post, really! And the video was perfect. I'm adding this to my list of to-makes. Just gorgeous. The video is super cute and helpful as well. So glad to hear you and your home are ok. Very pretty & tasty I sure! oh my goodness this is one of the cutest and most beautiful little cakes I have ever seen! Love love love this! Es una delicia de postre. Con un color tan bonito!! Te feliciot por esta receta tan fantástica. This looks like something my hubby would love, but I must admit I'm more of a chocolate lover myself. It sure did turn out pretty! Good to hear you made it through the tornadoes. We can only imagine how frightening it must have been, and still is, for many. I agree, "creature comforts" are best at a time like this, and how nice of you to include us by giving us this recipe. It's so bright and cheery... simply stunning, as is your website! I can't wait to make it (it will be my first roulade!). All the best to you and yours, and all the others who have been affected by those tornadoes. The video is completely adorable!!! I'm in MA so I'm pretty far away from any tornado damage, but I'm sure those who are going through tough times because of it will be cheered up by your video. those are absolutely stunning! such a happy confection to bring joy to the world. Ok. This was the cutest thing I've ever seen.......I thought the dessert itself was adorable until I watched the video....Oh. My. Gosh. I loved your little helpers, too! What a beautiful cake, great video too! Oh, Heavenly Heather! This is just so pretty and gorgeous AND heavenly! You take the best photographs of your creations also. I am saving this recipe and hope to try it one day. You are the master! ok. . . I am OBSESSED with your video! :-) WOW! ;-) makes it look SO easy! Did you hear the loud gasp that just came from my side of the computer screen? 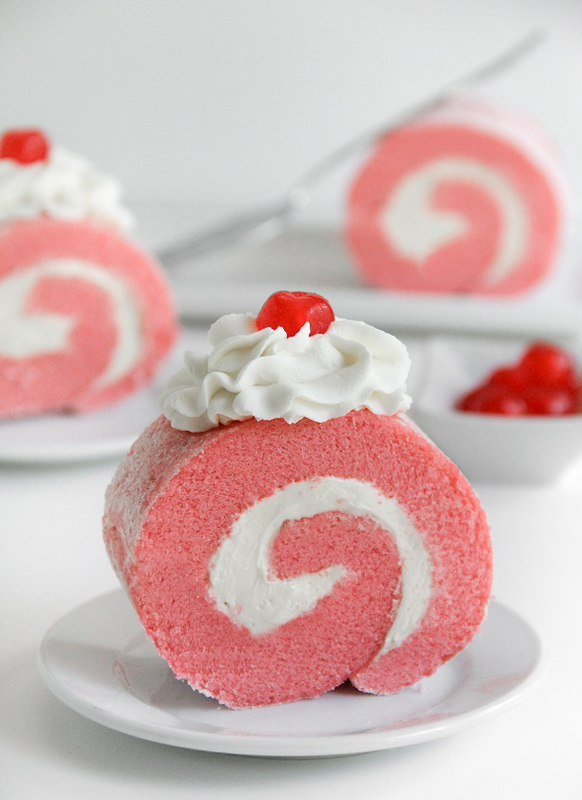 Seriously, this is the prettiest cake roll I've ever seen. Gorgoise! so pretty! I am loving this! This is so pretty! And I loved the video too! I don't know what I like better: your roulade or the fact that you enjoy Bic Cristals just as much as I do. Thank you for another lovely post and recipe! Hi, I loved your blog, it´s beatiful, I´m Spanish, I don´t speak English but CONGRATULTIONS FOR YOU BLOG!!!! The video was so adorable! 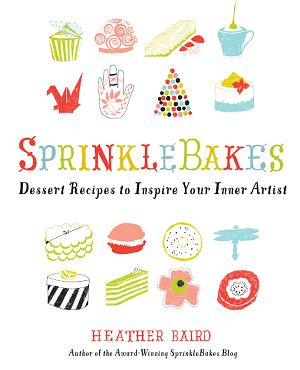 It made me want to find the song and then dance, sing, and bake all at the same time! You are always such an inspiration in so many ways! What a delightful video! 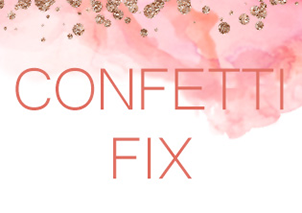 Everything is just right - the music, the lighting and your cute (and well-behaved) assistants. The cake roll is gorgeous and very inspiring. I'm posting a link on my Facebook Fan page (Mignardise). Love the pink and the sweet song! Beautiful! These look like they could also be called Watermelon Roulade although Pink Velvet sounds quite enchanting! Thanks for making this technique so simple! WOHOOOO this is such a NICE video right there!! SO great so positive...LOVE IT. Thanks so much for this post. The song in the video is Nancy Sinatra's "Sugar Town". This is my first post here, but not my first time here! Really love what you do! This looks perfect. And if it tastes how it looks, it tastes perfect. I want a bite. This looks just plain AWESOME! My mom's name is Rose and everyone calls her Rosie! Saw your comment on MM and had to drop you a note about it! What perfect rolling! I just made a cake roll too and it cracked for sure and the filling oozed out haha. Great job and thanks for the video. I actually have been looking for a pot like the one you scooped the flour out of. Would you mind sharing where you got that? Or who manufactures it? Thanks in advance! This cake looks absolutely lovely! Would be a beautiful dessert for a girly luncheon : ) I just found your blog (thanks to the Saveur Awards) and am blown away by your amazing photography and how perfect (without being fake perfect) everything looks. I'm looking forward to reading more! 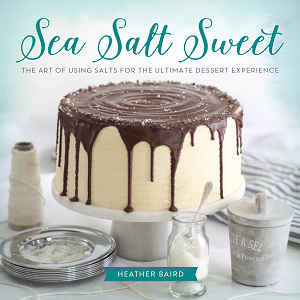 We never baked nearly enough at culinary school (here, if you're interested: "Culinary School: Three Semesters of Life, Learning, and Loss of Blood" http://amzn.to/eOKJWw on Kindle), but if we did, this is what I'd have liked to have made. The girly pink makes me want to smile, it is so pretty! Wonderful! I made a roll cake last week for the first time, but it didn't look that cool... I have to try this asap! thanks for sharing. always beautiful. That video was awesome awesome awesome. I have no idea how you found such a perfect song, but I loved it, and kinda want it for my iPod! My husband adores roll cakes of any kind, but I've never made one. It's my grandmother's specialty, so I've always let her do it. Your video proves to me though, that I *can* do it. Can't wait to try! I love your video!! My favourite bit is when your dog was curiously looking at the tabletop when you brought the tray to the table. Adorable. And needless to say, the roulade is awesome. I've made swiss rolls before, but both times the cake cracked during the rolling process - haven't tried making it for a while, now I have your video I have to try again! Thanks everyone! Xiaolu, I couldn't find any markings on the pans. I found them at an antiques store, but they are not antiques - they are new. Also, they came as a nesting set of 3. If I find them online I'll leave a link in your most recent blog post. Your friend's photos are harrowing. It's unbelievable to see the devastation. I can see why you feel like making comfort food, and your cake roll is comfort food of the most beautiful kind. This looks so delicious I'm going to have to try it this weekend. I can't wait! I'm happy the damage at your place wasn't absolutely horrible, but I am sorry to hear that there was any at all :( I hope everything goes well with the repairs! This is absolutely gorgeous! I came upon your blog today while looking at Blue Velvet Cupcakes on foodgawker and I can't get away from it. Beautiful, beautiful, beautiful! You and Bakerella are definatly my masters. I love you so!!! 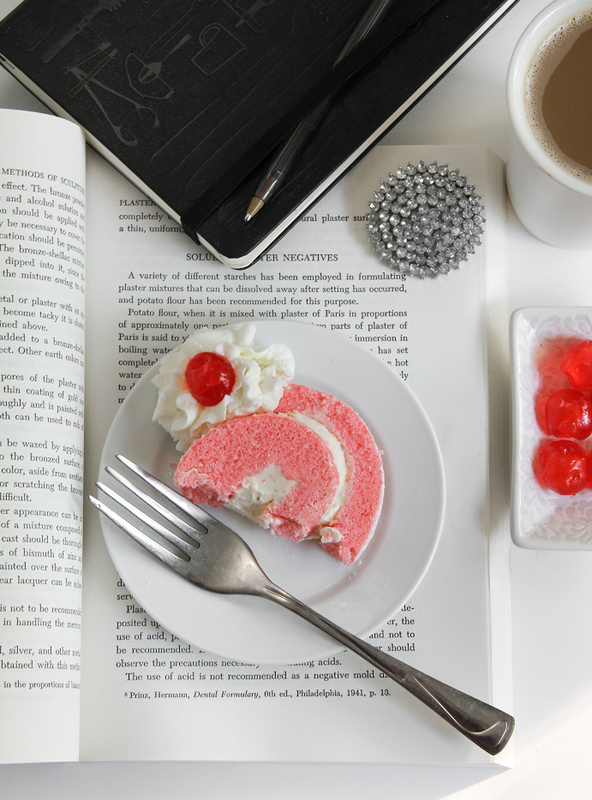 That is the prettiest styled photo of a pink roulade on a book with a brooch I have ever seen! Love the video!kisses fron greece! Would this work if I used a box cake mix? Hi, your blog is fabulous! Wow everything you make is amazing! I cant find one thing thats my favourite...everything is my favourite! Keep up the good work! I wouldn't use a box mix for this. The egg/liquid ratio to flour is much higher than a boxed cake mix. This looks so beautiful! I absolutely love the shot of it on the book, really inspiring food and photos yet again!! this looks so pretty! Loved your video with your doggies!! THis is so beautiful. I pinned it. 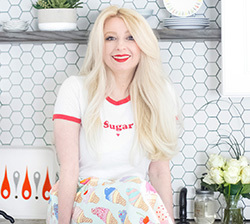 I love to bake (and cook) and live in Franklin Tn. I notice you live in East Nashville, a favorite part of town for food. I can't wait to try this, if anything, for the look of it. I came across your blog for the first time. You are amazing! Love the roulade and the champagne cupcakes. Love, Love, LOVE it! wow! great video! and lovely dogs! oh my, how did I miss seeing this one. So pretty in pink!!! just made this and it turned out really great for a first time try. ive never made a roulade before in my life. its very cakie and sweet but very pretty which is half the reason i bake. here is a picture of mine http://instagr.am/p/N3dnh/ proves anyone can do it! This looks so yummy and pretty. I can't wait to try the recipe. Thank you so much for sharing this wonderful recipe, I made this today for Valentine's Day and it's oh so perfect! I like to use ice cream as the filing for these type of cakes. Any suggestions for a good type of ice cream to use as a filler? my buttercream doesn't look anything like your photo. it's pale yellow after following your directions to the letter - and it's WAY buttery. it won't stand up to the cake. I made this for mother's day, she loved it well everyone did, i've never mad eone before it looked so pretty i had to try it, Thankyou. I don't know what i loved the most about the video, the lovely roulade or the super cute pugs! Any advice how to make it not shrink? :( Mine is shrink, is it cos too long mixing in mixer? Which is the name of the book that use for the amazing photo? It's about something of the starchs? Love the video! I should try it out sometime :) And what is the name of the song? I'd appreciate it if you answered. Thanks!